Why Put Nitrogen in Your Tyres? Oxygen leaks out of tyres faster. Nitrogen maintains tyre pressure longer than oxygen. The oxygen molecules in compressed air are smaller and leak out three to four times faster. Adding the correct type of nitrogen can help increase safety, improve performance and save you time and money and help do your bit for the environment by reducing your carbon footprint! So, what exactly is it all about? Converting to nitrogen in tyres can improve your fuel economy by up to 10% and increase your tyre life by 30% or more while dramatically increasing the safety of your vehicle. High purity nitrogen has been used for decades in Nascar, Formula One, the Tour de France, the US Military and many other applications where safety and economy are paramount concerns. Only the high cost and complexities of generating and properly administering nitrogen have kept it out of reach of the general public in the past. Recent advances in nitrogen production technology have now made nitrogen inflation economically viable for the automotive service industry - and NitroFill™ has led the way by providing a refined nitrogen product of incomparable purity. Our nitrogen generators have set the standard worldwide and are used by Fortune 500 companies, governmental organizations and military installations around the globe. In fact, NitroFill™ was selected, and remains, the sole nitrogen tyre inflation product used in the worlds largest economy's national fleet of B2 bombers. Not all nitrogen is created equal. Without proper application and adequate purity nitrogen inflation is of nominal value. NitroFill™ is the only nitrogen tyre inflation product guaranteed to provide the benefits of high purity nitrogen inflation. We breathe through technically advanced membrane fibres to separate Nitrogen from oxygen and water vapor. Nitrogen is no longer ridiculously expensive to produce. NitroFill™ is simple to install, safe and cost effective. See all benefits shown over <-----there! Why not buy your Wife, Girlfriend, Mother, Sister, Grandparents...this amazing gift for a birthday, Easter present, Mothers Day or just because you love them? ​Help make them feel safer when travelling, with this year long 24/7 roadside assist package for emergency towing, emergency fuel, water or oil delivery, minor roadside repairs, flat tyre change, jump start for flat battery, lockout service, and much more, all for the one low price of just $39 which also includes Nitrogen Fill to your tyres to help save you money and helps reduce your carbon footprint! Compressed air is your tyre’s worst enemy. Air is about 78% nitrogen, 21% oxygen, and 1% other. Nitrogen is inert, non combustible and non corrosive. Oxygen, on the other hand, is immensely destructive to rubber and other tyre materials. As soon as a tyre is manufactured and exposed to air, the effects of “oxidation” begin to deteriorate the rubber. Over time it loses its elasticity and strength, just like an old rubber band you’ve probably found around your home. This same process occurs in tyres inflated with air as the oxygen attacks the rubber molecules, working from the inside out, until the oxygen, and its destructive properties, permeates the tyre structure and ultimately the tread. Is all Nitrogen Gas Equal? No, the purity of nitrogen available from nitrogen generators generally ranges from 95% (low purity) to 99.9% (high purity). The Nitrogen generators we use can produce nitrogen in excess of 99.9% purity and provide the procedures to guarantee a minimum of 95% purity in the serviced tyre, which is the minimum allowable purity that must be maintained in the tyre to enjoy the benefits that nitrogen provides. Few generator manufacturers currently discuss this mandatory 95% threshold, as few are able to consistently provide the required purity to achieve it. But, as the market matures, you, our customer WILL learn –so don’t take chances with your safety or our reputation- fill your tyres with NitroFill™ from Dog Tyred, Kallangur! My Tyres are Low! Now What? A leak. Most tyre leaks are the result of a hole or puncture, faulty valve, or a porous or corroded wheel. Permeation. Permeation is the normal process by which the air in a tyre bleeds through the tyre’s body or carcass. It is typical for an "air" filled tyre to lose 1-2 psi of pressure every month through normal permeation whereas it can take several months for a NitroFilled tyre to lose a single pound of pressure. Temperature Change. All gases expand and contract with temperature. If you live in an area that experiences dramatic temperature changes, as in Queensland, you will have to adjust your tyre pressure accordingly. Typically you will only have to adjust your tyre pressure "up", adding pressure as ambient temperatures decrease. Count on losing about 2% of your total tyre pressure for every 10 degrees in temperature reduction. Participating NitroFill™ dealers will always check and correct your tyre pressure with NitroFill™ for free during your membership period, and we recommend you have this done every 30 days if possible, or as often as your schedule permits. If you have NitroFill™ in your tyres and do not have a leak, you should experience little or no pressure loss from permeation, but may still see pressure loss from seasonal temperature changes. While it is best to visit your NitroFill™ dealer for a free top off, it is fine to correct your tyre pressure with regular compressed air for these normal and minor events without diminishing the benefits of NitroFill nitrogen filled tyres. 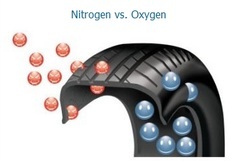 If you have a "flat" tyre or a situation where most or all of the nitrogen in your tyre has been lost, you can also fill it with regular air if necessary, but we encourage you to visit your NitroFill™ dealer as soon as possible to have the tyre(s) purged and refilled with NitroFill™ so you can continue to enjoy the benefits this product provides. If you are a member of the NitroFill™ Auto Club most flat tyres caused from road hazards, including tyres damaged beyond repair, are covered, as is roadside assistance if your flat or damaged tyre has left you stranded. Will NitroFill™ improve the performance of the Tyre Pressure Monitoring System on my vehicle? Yes. NitroFill™ will help maintain proper inflation in your tyres and reduce the number of faults detected by the TPMS. Do I still need to check tire pressure? Yes. But, you will find the tyre pressure to be more consistent, even during dramatic temperature changes. Should I put NitroFill™ in my spare tyre? Absolutely! Your spare tyre is the most neglected tyre on your vehicle, and if you need it you certainly want it to be fully inflated. Because NitroFill™ dramatically slows the normal loss of pressure through permeation, your spare tyre will hold its proper pressure over a much longer period of time than if it was filled with regular air. Is NitroFill™ compatible with my internal tyre balancing product [powder, beads, fluid]? For sure, in fact, you couldn't find a better operating environment for an internal tyre balancing product than a tyre filled with NitroFill™ due to its dry, inert qualities. Is Nitrogen a Safety Hazard? No. Nitrogen is an inert, noncombustible, nonflammable, non-corrosive gas. In fact, those are big reasons why nitrogen is used to fill the tyres of vehicles that push performance limits under extreme conditions, including Formula One racers and heavy machinery. In 7 million miles of truck tyre testing, nitrogen inflated tyres lasted longer. You will also receive regular economy focused info or newsletters and reminders for FREE tyre checks and NitroFill™ top-offs at your participating NitroFill™ dealer. No other inflation product offers the benefits of NitroFill™. Don't settle for plain nitrogen, insist on NitroFill™. Nitrogen Tyre Inflation by Dog Tyred's NitroFill machine! Nitrogen in tyres is becoming a very popular replacement for air, and for good reason. With proper inflation procedures and adequate purity nitrogen can provide amazing benefits. High purity nitrogen has been used for decades in Nascar, Formula One, the Tour de France, the US Military and many other applications where safety and economy are paramount concerns. Only the high cost and complexities of generating and properly administering nitrogen have kept it out of reach of the general public. Recent advances in nitrogen production technology have now made nitrogen inflation economically viable for the automotive service industry - and NitroFill™ has lead the way by providing a refined nitrogen product of incomparable purity.